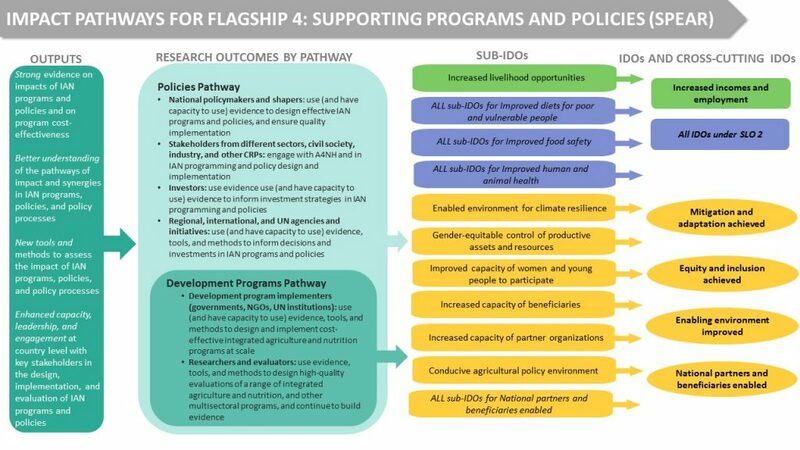 This Flagship Program seeks to address major gaps which remain in our understanding of the agriculture-nutrition disconnect-- that is, the relatively small changes in nutrition in places (especially low- and middle-income countries) with high dependence on agriculture-based livelihoods and large changes in agricultural policy and practice. SPEAR builds on A4NH's resources, capacity, and experience with global and regional initiatives in Africa and South Asia to support countries in tackling these goals. CoA1: Integrated Programs to Improve Nutrition (IPIN) focuses on understanding and documenting the contribution of integrated agriculture and nutrition programs to improvements in maternal and child nutrition in order for development program implementers and investors (governments, NGOs, UN institutions) to use the evidence, tools, and methods to design and implement cost-effective nutrition-sensitive agricultural programs at scale and for researchers and evaluators, including in CGIAR and other CRPs, to use evidence, tools, and methods to design high-quality evaluations of nutrition-sensitive agricultural programs and other multisectoral programs, and strengthen the evidence base. CoA2: Supporting Countries through Research on Enabling Environments (SCORE) focuses on understanding how enabling environments—such as policies, institutions, and governance—for nutrition can be created and sustained so that regional, international, and UN agencies and initiatives, as well as investors, can use evidence, tools, and methods to inform decisions and investment strategies to guide and support nutrition-sensitive agricultural programming and nutrition-sensitive policies and so that national policymakers and stakeholders from different sectors, civil society, and industry can use evidence to design effective nutrition-sensitive policies and strategies to enable effective programming. CoA3: Capacity, Collaboration, Convening (3C) focuses on strengthening capacity to use and demand evidence, and on providing a bridge to other flagships, CRPs, and relevant national, regional, and global processes in order for stakeholders from different sectors, civil society, and industry, including CGIAR and other CRPs, to have improved capacity to generate and use evidence to improve nutrition-sensitive agricultural programming, nutrition-sensitive policy making, and implementation. 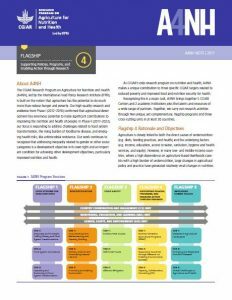 Read more about Flagship 4 and A4NH's work on Supporting Policies, Programs, and Enabling Action Through Research, as well as other news and updates on this topic. In 2017, KI3 researchers undertook a systematic mapping of organizations or initiatives that provide knowledge on how to optimally implement nutrition interventions. The systematic mapping was the first exercise of its kind. The research team screened hundreds of entities that work on nutrition and then collected extensive data on their characteristics, including their countries of operation, funding sources, nutrition aims, type of knowledge resources provided, phase of implementation their work contributes to, tools used to disseminate the work, and more. The attachment provided here is the resulting systematic map, and contains all of the data collected for analysis. If you would like more information on the map, please contact Roos Verstraeten.